Saratoga PLAN has helped conserve another beautiful and productive farm in fast-growing Saratoga County. With a high percentage of “prime” soils, beautiful views toward the Hudson River, and nearby productive dairy farms, the 144-acre Fiddle-i-Fee Farm in Bacon Hill, Town of Northumberland, will be permanently conserved with the aid of local, county and state funding. To make this possible, Saratoga PLAN worked with property owners Cathy and Neil Roberts, who bargain sold the conservation easement on the property. The closing took place on October 24, 2017. Funding for the purchase included $80,000 from Saratoga County and $450,048 in Hudson Valley Agricultural Enhancement Program funding from the NYS Department of Agriculture and Markets. Saratoga PLAN managed the grants and transaction, prepared the property baseline documentation, and performed all due diligence. The grants paid for the transaction costs and partially compensated the Roberts for the conservation easement’s permanent restrictions they placed on their land. The Roberts will continue to own and manage their farm, and the legally-binding conservation easement stays with the property in perpetuity, as ownership changes over time. Saratoga PLAN accepted ongoing responsibility for monitoring and enforcing the land use restrictions of the conservation easement. The property includes views overlooking the Hudson Valley, extending over the hills of Washington County to the Taconic Mountains and the Green Mountains of Vermont. It would be a highly sought after location for development, and is close to fast-growing Saratoga Springs. The conservation-minded landowners wanted to conserve the property for agriculture, timberland, scenic views and as an environmental buffer to the Hudson River. A portion of the land is utilized by the nearby dairy, Welcome Stock Farm. PLAN Executive Director Maria Trabka added, “Thanks to property owners Neil and Cathy Roberts, the Town of Northumberland, Saratoga County, and New York’s Department of Agriculture and Markets, Saratoga PLAN has been able to assist in protecting another important and beautiful piece of Saratoga County’s disappearing farmland.” She noted that Saratoga PLAN is working on several other important farm conservation projects that will help ensure a safe and secure local food supply for the future population in the fastest growing county in New York State. 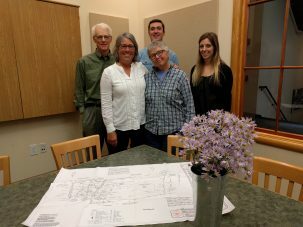 In the photo Neil Roberts is to the left, with Executive Director Maria Trabka next, then Stewardship Coordinator Greg Redling behind, with Cathy Roberts next to Maria, and Program Assistant for Operations Dana Kear to the right.